New Hope Foundation was founded in 2007. The foundation was born out of a high school community service project of Rendon Petroff, Kip Petroff’s son. What started as a freshman volunteer service program had, by his senior year, grown too large for teachers and administrators to successfully manage. As the student leader of the project, Rendon refused to abandon the community he and other students and parents had worked so closely with for four years. Having experienced firsthand the effect one person can have on the lives of others, and witnessing the powerful transformation that takes place when individuals are provided the resources necessary for self-empowerment, the family took up where the school left off. Petroff bought the rights to the project and today, thirteen years after its inception, it has grown exponentially, involving 150 volunteers and the development of numerous satellite communities throughout North Texas. The Directors of New Hope Foundation are Kip Petroff, Suzi Petroff, and Reverend Johnny R. Flowers. Suzi & Kip Petroff standing outside the abandoned Exxon Jiffy Lube that is now the Empowerment Center. 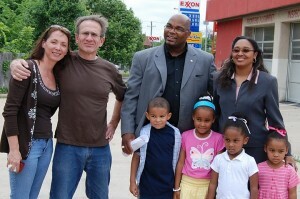 Pictured here in 2006 along with Director Johnny Flowers and his family. In July of 2010, Kip Petroff and his wife, Suzi Zimmerman Petroff completed construction of a 5000-square foot, adult learning center in South Dallas – the Empowerment Center, which offers support and assistance to individuals living in South Dallas who want to improve their lives and are willing to take an active role in the process. What started as a few eager and philanthropic high school boys has grown into a foundation that will continue to lift individuals from the oppression of poverty for generations to come. New Hope Foundation could not carry out its mission of help and hope in the community without the generous support from many individuals, businesses and other charitable organizations. Please click here to see a list of some of our amazing community partners. New Hope Foundation brings hope to impoverished communities of Dallas, Texas, through specific programming that empowers individuals to create positive life change. New Hope Foundation improves the lives of underprivileged families living in North Texas through life skills programs, educational programs and scholarships, senior programs, and family focus programs that assist and empower individuals seeking to break the cycle of poverty in their own lives and in their communities.